In the world of the Ultimates, Marvel Comics' reimagination of its superhero history, the Nazis (with a little outside help) were the first to develop a hydrogen bomb. They failed to win the war only because Captain America managed to sabotage the prototype, a mission that ended in his own apparent death. Flash ahead 55 years, when industrialist/inventor Tony Stark, creator of the Iron Man armor, is working to build a government-sponsored superteam with the aid of S.H.I.E.L.D. head Nick Fury. His team includes Bruce Banner, whose previous attempts to reinvent Captain America's super-soldier serum led to the creation of the Hulk; physicists Hank and Janet Pym, who alter their sizes according to their needs; and the Earth-loving Thor, who is possibly a god and possibly a nutcase, but whose prowess with a hammer is inarguable. The discovery of Captain America, still breathing and suspended in ice, gives the project the kickstart it needs. All that remains is a villain to fight -- and someone on the team knows where to find one. 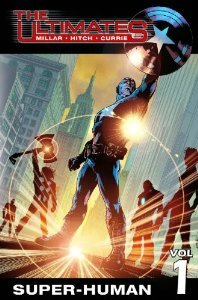 Like Marvel's Ultimate remakes of Spider-Man and the X-Men, the Ultimates have significant differences from the mainstream Avengers on whom they are modeled. Captain America, for instance, is a little more Ramboesque, and his pal Bucky -- more publicist than sidekick -- survived the war and aged at a natural pace. The Pyms have no magically adaptive costumes, so -- unless they have time to change after shrinking or growing -- they go into battle naked. Thor is more aloof from his fellow heroes, more new-agey in attitude and chummy with the normal folk who adore him. Banner harbors strong, subconscious libido issues along with his secret rage, and Janet learns that sometimes the worst villain is at home. The franchise, which has been growing stale, has a fresh start to build upon. Now, where's volume two?